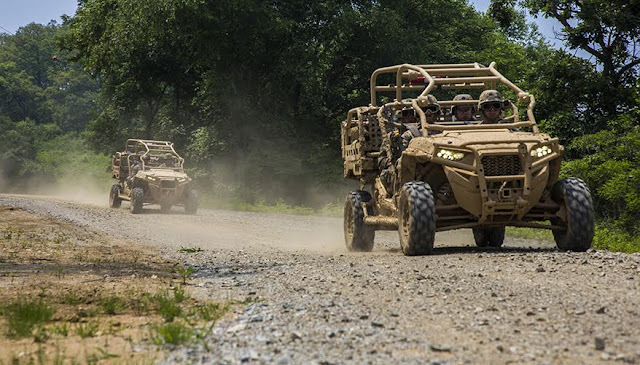 The Marine Corps plans to release a request for proposals later this year for a new family of ultralight tactical vehicles, an acquisition official said Feb. 5. The future platform, known as the ULTV, would replace legacy utility task vehicles. The service plans to buy more than 500 next-generation systems, said Jennifer Moore, a product manager at Marine Corps program executive office land systems. “We are seeing an increased demand from the Marines” for this type of capability, she said during a presentation at the Tactical Wheeled Vehicles Conference in Monterey, California, hosted by the National Defense Industrial Association. “They’re finding new ways, inventive ways to use the [legacy] UTV,” she added. The service released a request for information for the ultralight tactical vehicle in November. An industry day held in January attracted more than 20 companies including original equipment manufacturers, integrators and component suppliers, she noted. “There’s definitely an opportunity for you to participate in that arena,” she told conference attendees. PEO Land Systems is looking for a modular, off-road utility vehicle that can be quickly configured to provide logistical support for infantry units, and perform casualty evacuation, command and control, and electronic warfare missions, according to an RFI that was posted on FedBizOpps. It also wants a platform that can carry crew-served weapons and be internally transported by MV-22 and CH-53E/K aircraft. Moore doesn’t anticipate that the vehicle will need a large amount of armor for survivability. “For the UTV … we use our speed to evade and our size to evade” enemy threats, she noted. “This is not an assault vehicle. It is to lighten the load of the warfighter and then also to provide [casualty evacuation] support. As far as ultralight tactical vehicle is concerned, I’m not expecting those requirements to change,” she added. The Marine Corps doesn’t want lengthy prototyping or development work to be required, she told National Defense. The service wants industry to offer a high technology readiness level, high manufacturing readiness level, “state-of-the-shelf” capability, she noted. Warfighters need “the best tool at the best value in the quickest amount of time possible,” Moore said. When I first read this I was a bit miffed. Why not do a sole source and keep the rig you're using right now. You have many options out there...many ATVs can be "militarized" for USMC use. Textron, CAN-AM, Polaris, Honda and others are all ready to offer a militarized version of their ATVs. We can get what we need at a price that won't break the bank. This is being a guardian of the the taxpayers dollar. Considering the F-35B and CH-53K, it's a bit late but nice to see none-the-less.